Earlier this month marked 3 months that I’ve been at Rock Hills Ranch. I’ve learned a lot and I can’t wait to see what else I will learn. I was going through my photos the other day and realized that I have lots of photos of grass now. Luke made the comment that we take care of the grass; and this is true, but it has also taken care of the breed of humans who are called cowboys. We are just about done cutting hay here at RHR and normally I listen to a country music stations as the Twins game have an extremely annoying squeal. I was cutting hay down on the flats and I heard a couple songs that inspired this journal. Jason Aldean’s song “Fly Over States” has always been a favorite of mine, but especially the line that says “Feel that freedom on your face, breathe in all that open space.” Jamey Johnson sings “In Color” which is the story of a Grandfather explaining all of his black and white photos to a grandson and he states “They say a pictures worth a thousand words, but you can’t see what those shades of gray keep covered, you should have seen it in color.” Lately I’ve been trying to get a lot of work done during the day light hours so I can take the dusk time to go check cattle when it is cooler and there is more activity. I sat there on Elmer (one of the horses here) and I saw a pretty nice sunset- if you like cows and hills and grass like I do. I’ll see if I can paint the picture for you. The golden sun was almost done with its descent down the western half of the sky, about 45 minutes from dropping behind the top of the ridge covered in grasses and forbs and sedges and other plants. There were wispy clouds piercing through the baby blue sky and at times covering the sun and negating the warmth for a few seconds. The air was still for a few minutes and the sound of the mature cows munching grass and calling to their calves, who were about 100 feet away running and jumping and fighting their herd mates, filled the air. Across the valley you could hear the bulls bellowing to establishing their rank on the totem pole for the remainder of the breeding season. The air was still enough and my perch atop Elmer was just right that you could feel the vibrations from the low sound waves coming from the bellies of the bulls. The grass is more tan than green this time of year; it’s dry here. – We are very grateful of every drop of water that we get. – The Kentucky bluegrass has headed out and is maturing to a tan color and the brome grass is hanging onto every ounce of green pigmentation that it has. A light, light green appears every now and then in a patch of wormwood. The only really green patches are the buck brush leaves and just up stream from dugouts. I sit atop of a sorrel (kind of a reddish color) gelding with a white blaze on his face and 3 white socks on his legs. My striped brown saddle pad and my big Hereford saddle cover his back. The sun is just right to blind me by the glare that comes off my spurs and I think “man, that’s bright”. I look up at the western horizon and determine that it’s time to head back into the yard. I signal for Elmer to move and cue him to start long trotting most of the 3-mile journey home. I had things a little backwards from the typical cowboy and sunset picture, as I was riding southeast and the sunsets in the west southwest. There I am, long trotting a sorrel gelding through grass that almost reached his belly and my cinch, my spurs jingling and the leather squeaking. It was like I had rode right out of a John Wayne Movie. I am very fortunate to be spending this time here. There’s just something about the wide-open spaces that help a young man sort through all the things on his mind. The rolling hills, the rocks bigger than my car, the ocean of grass. 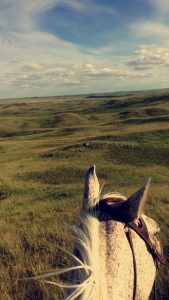 Rock Hills Ranch has numerous places that you can look out from the top of a hill and see what freedom looks like. I wanted all of you readers to try to paint that picture in your mind before you got to a picture I snapped while on my way back in to the yard earlier this summer. So I Described my ride on a reddish horse at sunset, but I like this picture better. Keep your cinches pulled tight everyone.